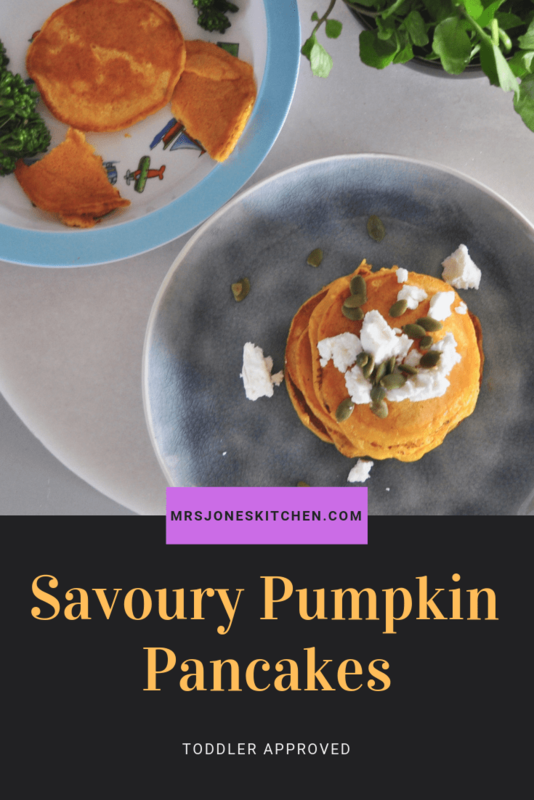 These delicious savoury pumpkin pancakes are really easy to make, and are the perfect breakfast, lunch or supper for the whole family! I know my last recipe was for pancakes (these ham and cheese galettes) but I seem to be making various types of pancakes pretty frequently at the moment. Not only are they toddler friendly (Mini Jones can eat a surprising about at one sitting!) and a great finger food, the whole family love pancakes, whatever the time of day – which is always a winner in my book as it means less cooking for me! 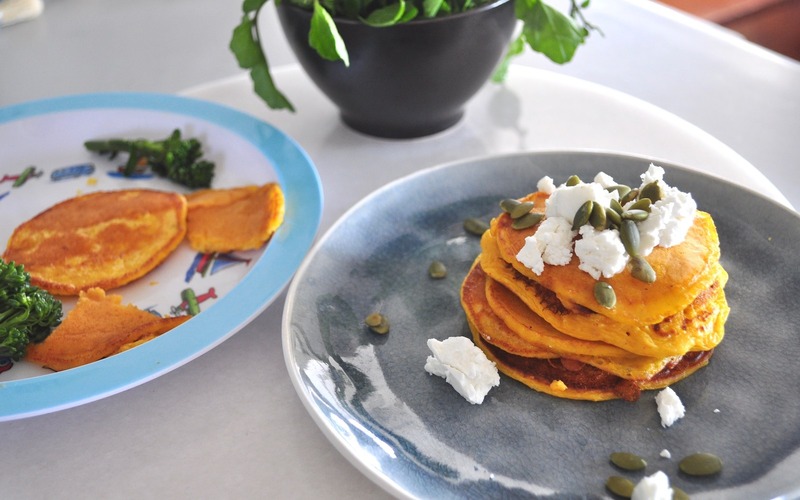 These savoury pumpkin pancakes use pumpkin puree – which is pretty easy to make (see tip below) and lasts for 3-6 months in the freezer, so I tend to make double the amount then freeze half to use later. I use cornflour in the recipe as I tend to find Australian flour heavier then other country’s flours. If you don’t have cornflour you can use potato starch, tapioca starch or rice flour. This recipe serves 2 adults and 1 toddler. In a large bowl, mix the flour, cornflour, baking powder, and parmesan together. In a seperate bowl, mix the pumpkin puree with the egg and milk and whisk until well combined. Pour the wet ingredients over the flour mixture, then stir lightly to combine. Heat a non stick frying pan over a medium heat and add a little olive oil (about a tsp). Place tablespoonfuls of the batter in the pan - depending on size of pan you can cook 2-3 pancakes at a time. Cook for 2-3 minutes until the underside is golden, then flip over and cook for another 1-2 minutes. For this recipe you'll need approx. 1 lb/ 450g pumpkin. Peel the pumpkin, take out the seeds and roughly chop into chunks. Cover with water and bring to the boil. Boil for 20 minutes or until tender. Drain well & cool then mash with potato masher or puree in a blender. A little extra grated parmesan over the top, a spoonful of herbed sour cream or ricotta on top with some pumpkin seeds, or some crispy bacon! They are lovely cold and make a great toddler snack or lunchbox filler, either plain or spread with cream cheese. These sound so incredibly delicious! I have never had a pumpkin pancake before, but I will certainly be changing this soon! YUM! I love the addition of pumpkin and parmesan. Perfect for shrove tuesday!